Many companies talk a lot about contributing towards cleaning up the environment or doing their bit to reduce global warming, but very few actually take any concrete steps towards this end. It all boils down to their profit margins and how costs can escalate if they look for more sustainable methods. Just see how expensive something that is labeled ‘organic’ is. Global beer brand, Corona, has decided to go the distance in taking a few steps towards creating a cleaner environment. Beginning in 2019, the company will introduce 100% plastic free six back rings in a few markets. 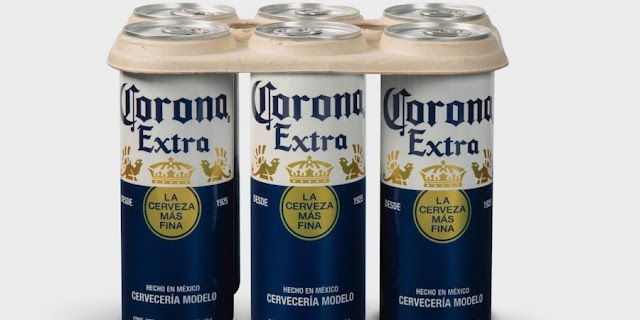 Smaller beer companies have already made this switch but Corona is the first global beer brand attempting to do the same. Tulum, Mexico, the homeland of Corona, will be the site for piloting these plant-based rings. Corona has teamed up with Parley for the Oceans, an organization whose main focus has been a cleaner environment. This move to switch to eco-friendly packaging will stem the rising pollution caused due to the unprecedented use of plastic. Corona’s plant-based rings are still in the testing stage. The company states that these environmentally friendly rings will not add to the already polluted planet but will degrade into organic material which will do no harm to wildlife. Environmentalists have been against the usage of six-pack rings for a fairly long while as they feel that the material used chokes the oceans and shores. This is a potential hazard for marine life. Saltwater Brewery was one of the first to reinvent the ring two years ago. They substituted the previous plastic material with a product that was derived from wheat and barley products. This compostable substitute can safely be consumed by marine creatures like fish and turtles thus lowering the threat to marine life. Several companies collaborated towards the creation of these biodegradable rings which are easily available at several outlets in Florida. ABC Fine Wine & Spirits, Lucky’s Market, Total Wine & More are a few of the outlets where you can source these rings. Carlsberg, another beer company also announced its plans to phase out plastic rings and replace them with recyclable glue. This glue which can withstand cold temperatures is also easily recycled along with the can. He further stated that Corona shared their vision of getting rid of plastic for good.